What an interesting Saturday morning I had! 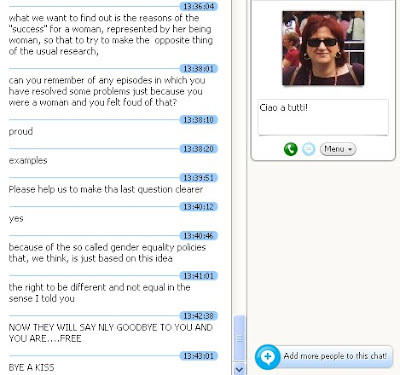 A good colleague friend from Italy, Daniela, had approached me some time ago whether I would be willing to take part in her students' project where they wanted to interview people from different countries about male and female roles in working life, or something along those lines. Naturally, I jumped at the chance! 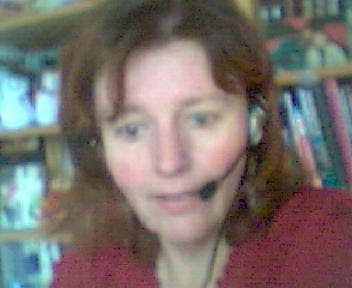 It involved setting up a webcam and doing the interview on Skype with Daniela's students videoing it all. I had to ask the help of my more net and tech-savvy daughter to set up the webcam on my computer - I'd never used it before! Managed to get my face on the screen with a couple of clicks, no problem. Even learned to take these fuzzy webcam shots. We had set up the interview time through email in advance, so at the pre-arranged time I was ready at my desk at home. While we lucky Finnish teachers were enjoying a free Saturday, our colleagues in Italy were busy at school. Unfortunately, something didn't quite work with our Skype connections, so even though Daniela and her students could hear me clearly, all I got was a constantly cutting buzz from their end, hardly one whole word could be heard at a time! Pity! The way we solved it in the end was for them to type the questions on the Skype chat, while I answered through the microphone. The set-up looked like this (although my webcam seems to be blank here, but it did work during the interview). They had some quite tough questions about equality between men and women, and whether I had had any episodes during my career where I felt being a woman had worked to my advantage, or what benefit to society as a whole the inherent differences between men and women could have. I now feel that maybe I should have had the questions in advance to think of better answers, but oh well... Especially with their last questions I seemed miss the point they were getting at. So far, I have really had any experience with voice communications in student projects, but this small experiment certainly got me interested. Maybe I will start looking into it more. From an EFL point of view this would definitely add a totally new dimension and much sort-after authenticity to lessons, otherwise carried out as mere simulations inside the vacuum of your classroom.